Better Buy: American Water Works vs. California Water Service Corp. Which of these companies is the better opportunity to wet your water-investment whistle? According to the American Water Works Association, approximately $1 trillion is necessary to maintain and expand water service to meet demand over the next 25 years. This reality, coupled with the fact that infrastructure has been on the lips of pundits and politicians recently, suggests that examining water utility stocks is a worthy endeavor. So let's consider two of the leaders in the industry, American Water Works and California Water Service, to see which company affords investors the best choice in terms of getting their feet wet (or wetter) with a water utility investment. American Water Works has been providing water and wastewater services to millions of customers for more than 130 years. The largest publicly traded water service provider by market cap, American Water Works provides water service to about 15 million customers across 47 states and Ontario. Notably, the company retains the distinction of being the only water-utility member of the Dow Jones Utility Average. Conversely, California Water Service is considerably younger; the holding company was only incorporated in 1999. The third-largest publicly traded water utility by market cap, California Water Service maintains a much smaller customer base: more than 510,000 customers in four states. In addition to California -- its primary source of business -- the company serves Hawaii, New Mexico, and Washington. The most decisive factor in choosing an investment, however, is hardly which business has the most customers or operates in the most states, so let's dive in and compare the companies on some important metrics to gain better insight. This brief look suggests American Water Works is the runaway winner. Its expansive geographic footprint affords it economies of scale that are clearly illustrated by its superior operating margin. Providing a superior return on equity over the past three years, American Water Works' outperformance of California Water Service in 2016 was clearly not an aberration. As savvy investors know, though, past performance does not guarantee future results, so let's take the plunge and examine these two companies even further. Although American Water Works provides services to customers in 47 states, it's the 16 states in which the company conducts its regulated business where it makes its hay. This geographic diversity affords the company a significant competitive advantage, mitigating the risk associated with adverse local weather phenomena. 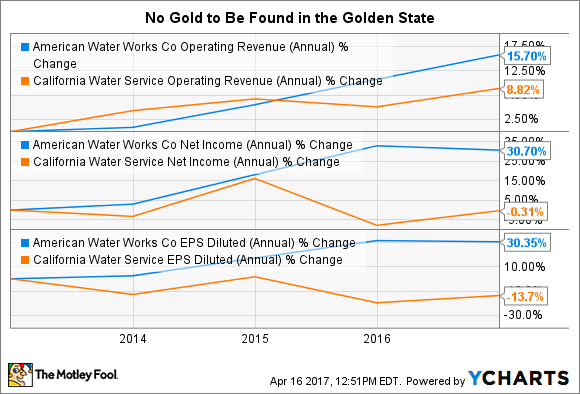 California Water Service, on the other hand, is in a much more precarious position -- essentially levered to the state of California. In fiscal 2016, for example, New Jersey and Pennsylvania accounted for 22% and 19%, respectively, of total operating revenue for American Water Works. Conversely, California represented 93% of total consolidated operating revenue for California Water Service during the same year. Unsurprisingly, the company was devastated by the drought that had devastated California. Although American Water Works also counts Californians as customers in its regulated-businesses segment, the state accounted for only 176,000 customers -- 5.3% of all regulated businesses customers. Clearly, American Water Works' diversified operations helped it to avoid getting burned. Reporting strong growth over the past five years is all well and good, but how about the future? American Water Works shows no signs of slowing down. Instead, it remains committed to further expanding its enterprise. In 2016, the company added 42,000 customers through acquisitions, and management reports that its pending acquisitions represent another 40,000 customers. By continually adding customers located in proximity to its established operations, American Water Works not only ensures top line growth, but it also affords the company the ability to further streamline its operations, bringing the increase in revenue down to the bottom line. How much, you ask? On its most-recent earnings call, management forecast a five-year EPS compound annual growth rate of 7% to 10%, anchored by EPS of $2.64 in fiscal 2015. Between its significantly smaller (and less attractive) customer base and smaller growth prospects, there is little to suggest that California Water Service represents a better opportunity than American Water Works. At one point, an argument could have been made that California Water Service offers the better opportunity because of its dividend. But at this point, that argument has washed away. 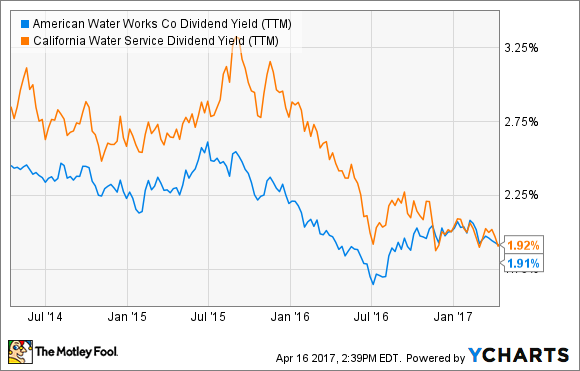 And considering American Water Works has grown its dividend 63% over the past five years according to Morningstar, while California Water Service has grown it only 13%, I'm more inclined to favor American Water Works as a dividend play. Lastly, a consideration of the companies' price tags represents the knockout punch. California Water Service may seem like a bargain in terms of American Water Works' sales multiple, but that's hardly sufficient cause; the two stocks essentially trade at the same valuation in terms of cash from operations per share. And in terms of enterprise value-to-EBITDA, California Water Service is more richly valued, which seems counterintuitive, since it doesn't seem to be holding some hidden value, and it doesn't seem poised to experience significant growth in the future. Without a doubt, the better opportunities for investors here is American Water Works. 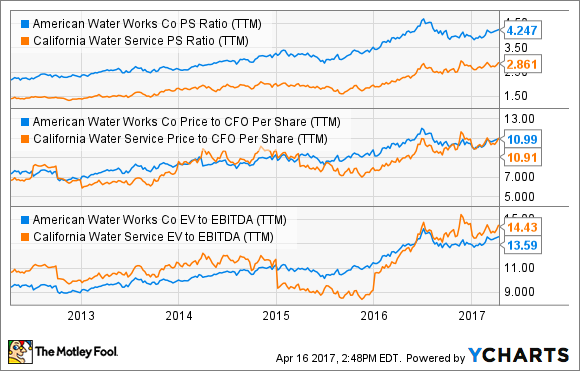 Moreover, As long as it continues to execute its growth-through-acquisition strategy, streamline its operations, and return cash to shareholders, American Water Works will probably remain the better choice.